Sunlight and skylight streaming through a window skip across a thoughtful figure. The reflective downward look is a foil for the edgy urban dress code. 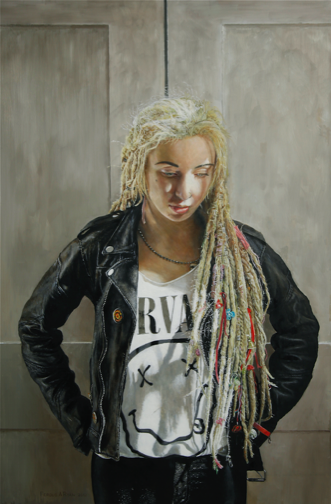 The leather jacket, T-shirt, dreadlocks and ribbons make this a work of art before it was painted. There are abstract elements to Dreadlocks. The formal rectangles of the door contrast with a series of circles in the figure. The circle formed by the girl’s arms are echoed by a series of circles from the ‘smiley’ design, T-shirt neckline, necklace and face to the sunlit hair.